Roger M. Cooper (born November 8, 1944) is a Minnesota politician and a former member of the Minnesota House of Representatives from southwestern Minnesota. 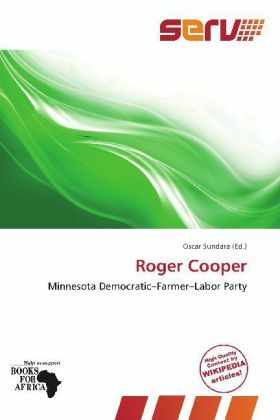 First elected in 1986 in the Democratic-Farmer-Labor Party s firestorm that swept through the region, giving Democrats unprecedented control of southwestern Minnesota for the next several election cycles, Cooper served five terms. He was re-elected in 1988, 1990, 1992 and 1994. He represented the old District 21B and, later, District 15B, which included all or portions of Chippewa, Kandiyohi, McLeod, Meeker, Renville, Sibley and Yellow Medicine counties, changing somewhat through redistricting in 1990.